To purchase “Whitechapel, mayn Vaytshepl” for £12.00 using Paypal, click on the button below. We have 2 CDs for sale. 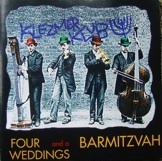 To purchase “Four Weddings and a Barmitzvah” for £8.00 inc p&p using Paypal, click on the button below.